Budco Security Seals is a stocking distributor of Tug Tight Security Seals. The Tug Tight Seals are an adjustable length “cinch up” our “pull tight” seals. This allows for greater flexibility where an adjustable Tug Tight Seal is needed. The Tug Tight Seal is a heavy duty, all plastic, one piece construction. 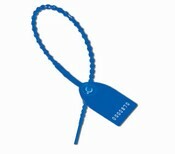 It is weather resistant and withstands extreme cold or heat. 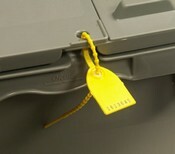 The Tug Tight Security Seals provide tamper evidence with its one use design. Budco stocks the Tug Tight Seals in multiple colors. Stock orders ship in 24 hours. We also provide the Tug Tight Seal in custom form. You can choose multiple colors, custom imprint and consecutive numbers. The Tug Tight Seals can also be bar coded.